It’s been pretty hard to avoid the fact that the UK has been hit by a storm of pretty mammoth proportions recently. All three of us had a snow day on Friday even though J did have to work from home. We’d had a bit of snow so far this winter so C and Jessie had experienced it a bit but this weekend it really came down hard. There is really something quite magical about the snow and the effect that it has on puppies and children. Even though it makes things so much harder it is just quite beautiful. That said I know that the storm has brought great tragedy and difficulty to many people so we are very lucky to have been able to enjoy its beauty. This was the scene on Thursday night when I insisted that J and I don our wellies and walk out to the field just to look at its beauty. Jessie has absolutely adored the snow and would have spent all day out there had we let her. She has sniffed and dug and bounded all over. The funniest thing has been throwing snowballs and her trying to fetch them back. On first seeing the snow C did ask “Can we open our presents now?” Which was pretty adorable and made me realise how much toddlers associate snow with Christmas rather than winter. I guess so many Christmas films show snow in them that the association is inevitable. The first thing C wanted to do was throw snowballs at daddy (which I strongly encouraged) and then build a snowman. It turns out that getting a toddler to build a snowman with a dog’s help isn’t as easy as you think but our garden is now proudly home to two snowmen (largely through the efforts of J but I did help). C was so excited about putting the coal for the eyes, although we were lacking a carrot for a nose as I had just used the last of them for our roast dinner so we had to adapt with extra coal and an apple. 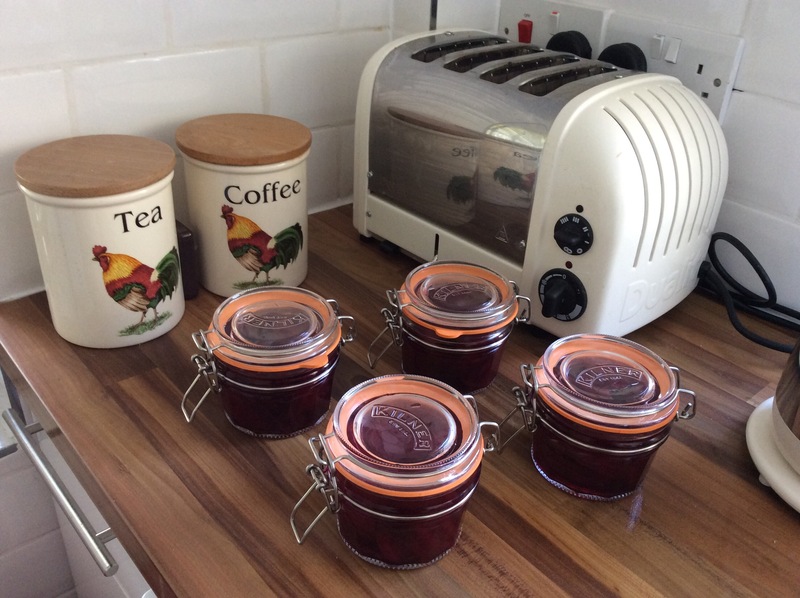 I’ll be interested to see how long they last and I think C will be quite sad when they melt. I themed our Christmas Eve hamper this year on Raymond Briggs ‘The Snowman’ and when she watched the film she was really upset when the snowman melted. I think the highlight of our snow endeavours for C was sledging. We already had a sledge in one of the sheds which J’s dad have over-excitedly bought a year ago when they said it was going to be a bit cold (no snow appeared that time). We don’t have any hills in the garden so C had to settle with being pulled around the field, which she adored. In fact to get her back inside we had to bribe her with the promise of hot chocolate with marshmallows. She later described her favourite part of the day as being sledging. Being ‘trapped’ at home was actually quite nice in many respects. We had milk in and used the bread maker to keep ourselves stocked up with fresh bread. I baked a lovely coconut and raspberry sponge which was lovely still warm from the oven and even better the next day with custard. I had been running the freezer down in preparation for the big move so it wasn’t quite as well stocked as usual. However, we were still able to rustle up some lovely meals; roast dinner, egg and chips, beef bourguignon and new potatoes, Boursin topped ciabatta pizza and of course porridge or eggs and toast for breakfast. It has really reinforced to me the importance of having a well stocked freezer as a family. When we have the work done my aim is to have a large American fridge/freezer in the kitchen and two additional freezers in the sheds. And maybe a chest freezer too if we start producing our own meat. I’m not sure how our veggies in the raised beds will have faired with the snow. We have strawberries and asparagus in there as permanent additions and our leeks which we planted back in October half term still in a bed too. I guess we’ll just have to wait for the big thaw to see how they have coped. The fire has proved invaluable in this weather. Some of our water pipes did freeze inside the house due to lack of heat but once we put all our electric radiators on they thawed by Friday morning. We’ve actually been quite toasty. The chickens have struggled in the weather and we have done what we can do for them but until it thaws properly it will be a bit touch and go for them. Their eglu is insulated and designed to withstand snow so they are fine in there but they really didn’t like coming out of it so we moved their water and food temporarily into their coop and are just going to have to wait it out and see how they do. We’ve still had at least three eggs everyday so they can’t be doing that badly but I’m prepared for the fact that we may lose a couple. Fingers crossed though. So I realised the other day that I have been putting pictures up on Instagram about Jessie but haven’t done an update on life with her for a while. Jessie is now 14 weeks old and has grown so much since we first got her. She is now allowed outside to interact with other dogs as she’s had her final set of injections (for now, I think she needs a booster at about a year old). J has found a lovely route to walk with her from our house, just up the round and onto a bridleway where she can be let off the lead. So far she is really good at coming back on command and doesn’t stray too far from us. We still put her back on the lead when we pass horses but she has shown a restrained curiosity about them so far. 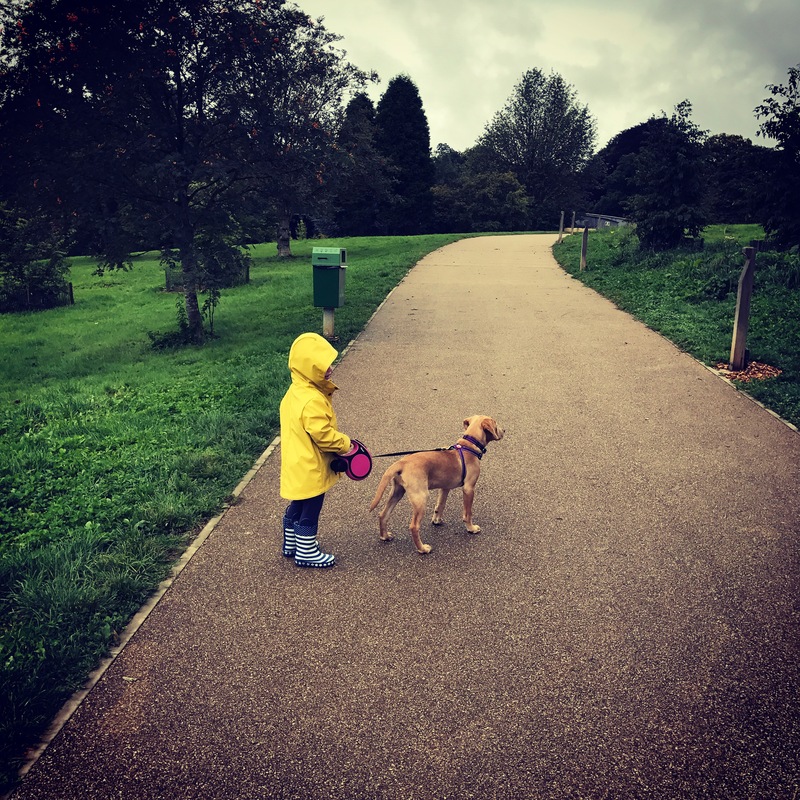 We’ve also taken her up to Westonbirt Arboretum which is great for both children and dogs as they have a huge section where dogs are allowed and have dog bowls and bins at various places as well as a cafe, shop and good toilets and changing facilities for children. We’re planning her first beach visit in a couple of weekends time which I’m sure she will love. She’s dropped down to two meals a day now, by her own volition really as she wasn’t eating her meals properly when she was on three so we switched her to two and increased the amount at each and now she eats everything up straight away. We made sure to keep offering her a good number of treats in the transition from 3 to 2 so she didn’t end up hungry. And we’re still soaking her last meal of the day for about half an hour before dinner, on advice from the vet, so that she doesn’t need to have water available in the night and it helps keep her fuller for longer (apparently). We’ll probably keep doing this until she is six months old. Though we have had the occasional upset food bowl when she brings a toy out with her to breakfast time! Thankfully she cleaned up after herself. 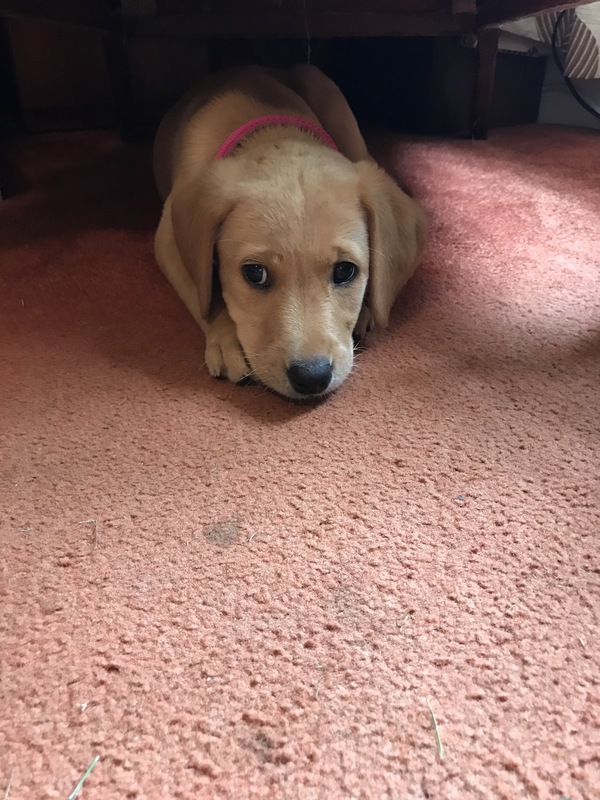 Puppy training, why do it? There is nothing worse than walking down the street and having a stranger’s dog bark at you, or growl, or bound up towards you and ignore pleas from their owner. Especially if you have young children or are nervous around dogs. 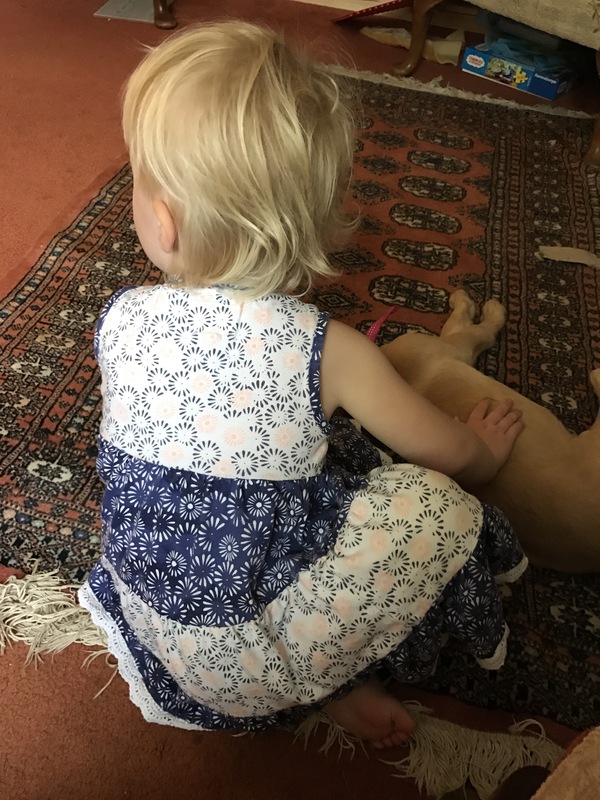 We have been lucky that C has encountered some friendly dogs so far but we know friends who have had bad experiences which have made their children very nervous around animals. We think it’s part of being a responsible dog owner to have control of your dog when out in public. 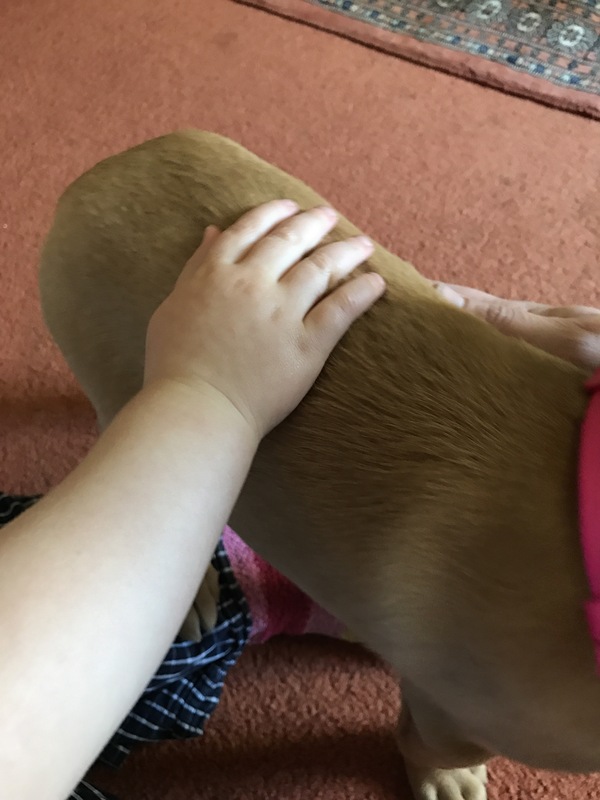 Not only that but we want to be confident that our toddler, and others who we spend time with, are safe around our puppy. A dog needs a recognised pack leader and, as J was the driving force behind having a dog, he is going to be in charge. So, therefore, he needs to be the person doing the training. As usual, he did extensive research and asked around to find the best local trainer and we ended up going for one recommended by numerous sources. 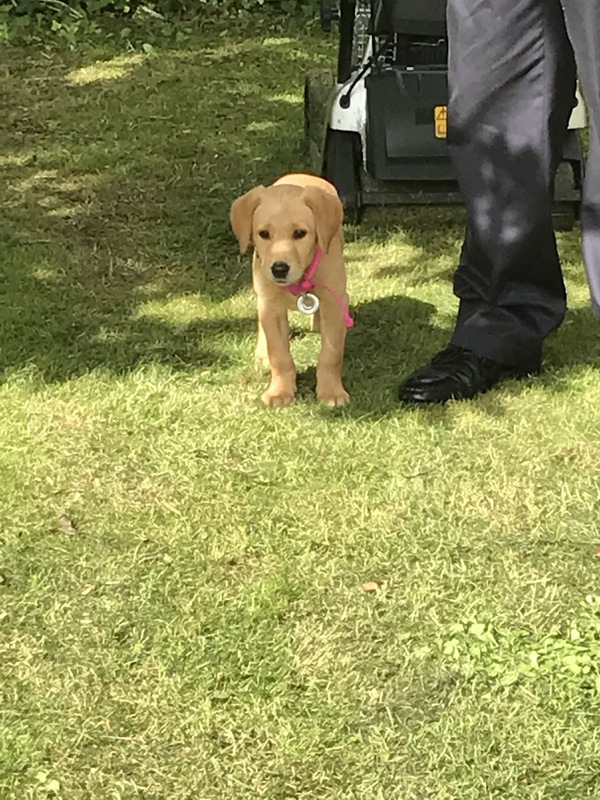 Last week, when Jessie was just 9 weeks old she went for an assessment/introductory session. For anyone who hasn’t already met her, this is Jessie. She’s a golden Labrador retriever and has a lovely temperament. Labradors are known for their intelligence and ease to train (one of the reasons why we wanted to get one). The trainer we went to said she would be easy to train and seems very amenable (but she probably says that to everyone). She will do a four week course (the first four Saturdays in September I think, once she has had all her vaccinations) and then after that she should have all the basics grasped. We will of course have to keep up with the training at home, even puppies have homework. The trainer already showed us some stratgies to start at home which I’ll go into more below. 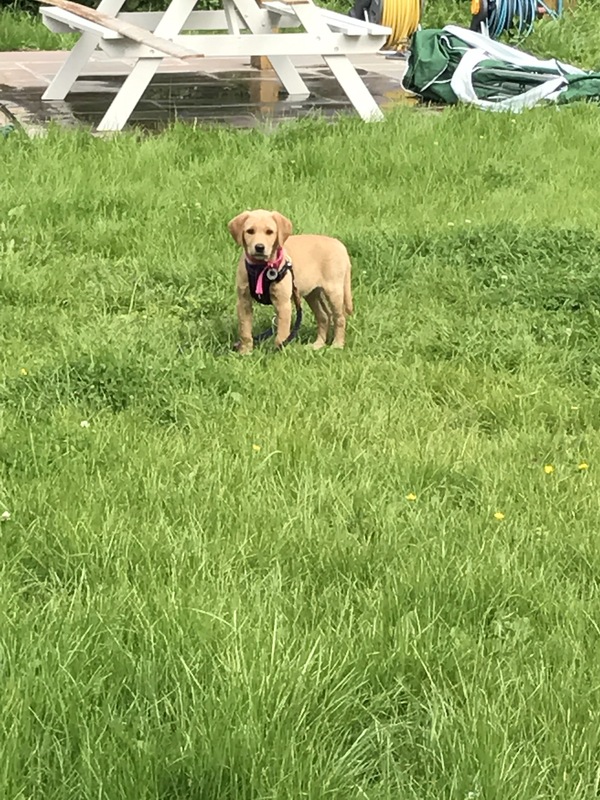 We’re also looking at doing gun dog training with her in case J ever wants to shoot with her (it will also mean she is super trained). The puppy should not walk ahead of you, she should ideally either be by your side or behind you. Slightly in front is ok if necessary but she shouldn’t be too far ahead. Use the puppies normal food as treats and give them lots of treats to reinforce good behaviour. Praise after, not during, the good behaviour. I hope this is useful to someone, once Jessie has started her proper puppy classes, I’ll do a more comprehensive training post. So we have now had Jessie as a part of our family for two weeks now and it feels like she’s been here for so much longer. Her confidence in her surroundings is growing and with this she has become more playful and more of a scamp. She’s done really well with housetraining and we’ve had very few, if any, accidents. We still do a bit of a poo watch after she’s eaten but she is taking herself to the backdoor most of the time. We’ve not heard a peep from her during the night which is brilliant and she’s using her puppy pad in the night as required. 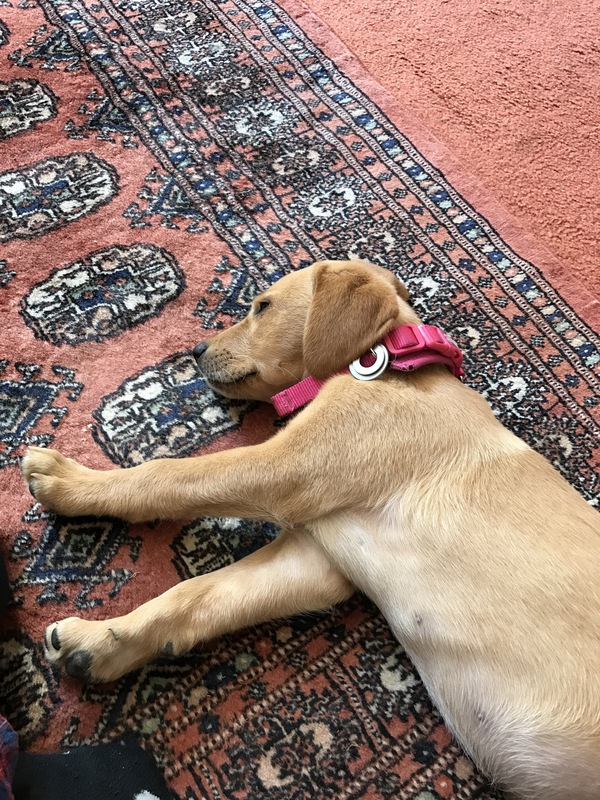 With labradors, mental challenge is as important (if not more important) than physical exercise so we’ve been giving her lots of different types of mental simulation. She’s been chasing an ice cube around the floor on a really hot day. Doing some basic training skills; she’s already mastered the ‘sit’ command and has been working on the ‘give me five’ (or paw) which she’s pretty good at. She’s got the hang of ‘fetch’ now but she doesn’t always like to give back the thrown article and instead likes to play tug of war, more practice needed I think. Next step is ‘down’ to get her lying down which she’s quite a way off so far. I’ve got a post about training to come later this week. She was due to have another one of her vaccinations on Saturday but had a bit of a rash on her tummy (the vet says it’s an allergic reaction possibly to washing powder or poison ivy and she has antibiotics to remedy it), so couldn’t get them this week. Hopefully she’ll be alright to have them next week instead. As she seems to be a big fan of trying to chew everything we’ve introduced a great tip from some friends of mine. We fill her Kong with cream cheese and then bung it in the freezer (Kong do sell their own product to fill with but it is a bit overpriced). 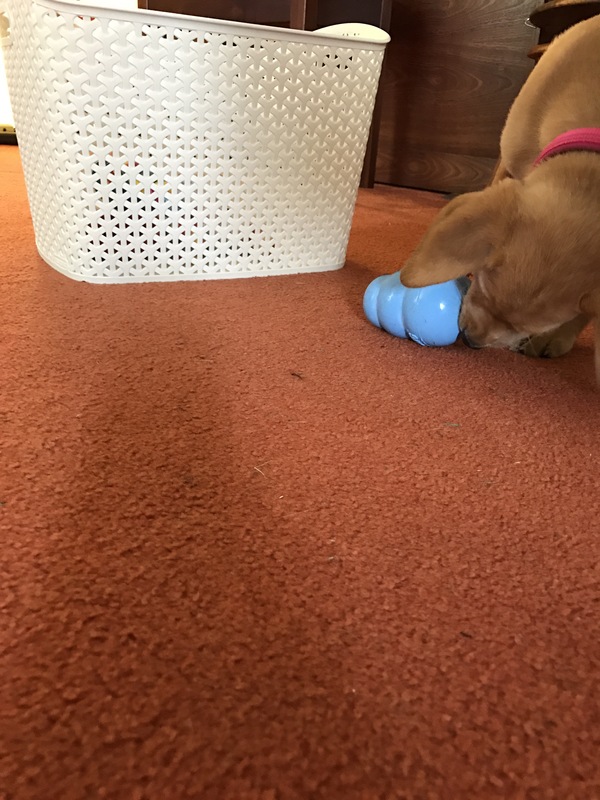 Then when it’s out the freezer it can keep her entertained for ages trying to lick it out and the coldness helps to numb her sore gums (kind of like bonjela for puppies). Jessie is getting better at walking on the lead in the field although we are finding that whenever we’re out with C she always insists on holding the lead as well. It’s going to be an interesting time when Jessie starts getting bigger! Jessie, end of week one: ﻿what were we thinking? So today we have had Jessie home for a week. 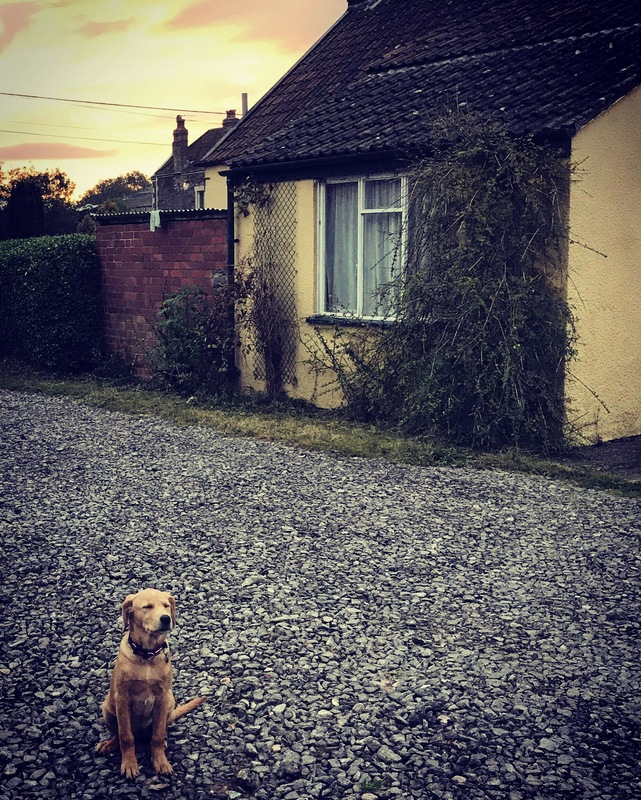 Although we would have considered ourselves prepared (I had a family dog growing up, we’d thought about puppy proofing﻿﻿ and had bought all our supplies, we’d even read a book), we weren’t. Well we were as prepared as we could have been but nothing can really prepare you for how much your life will change. Same as having children really. 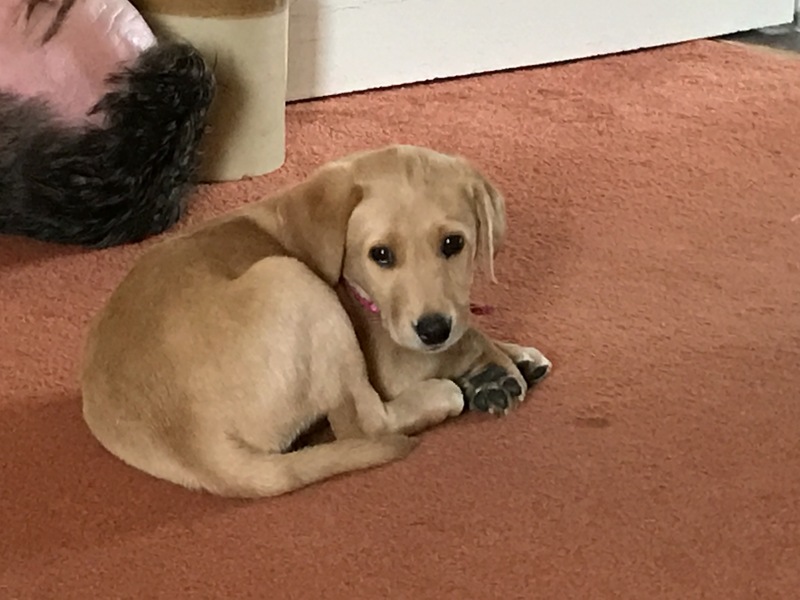 We have been really lucky as Jessie has a lovely nature and has settled really well with being away from her mum and six siblings. We’ve also been lucky that C and her have bonded well and C has embraced having her join our household. J and I have been keen that Jessie has to fit in with our lifestyle and whilst we are willing to make concessions as she settles in, ultimately she will have to muck in with the rest of us. However, for this first week we have spent time working out Jessie’s needs and routine and seeing how it will fit in with our lives. So this is where we’re at with our now nine week old puppy’s routine. J gets up at 6 and cleans out the cage, as required, and gives Jessie her breakfast. He then takes her for a couple of laps around the field, he’s currently at one with the lead so she learns how to walk well on it and one without with her walking next to him. She also normally manages her morning toileting during this, both varieties. I get up at around 7 and make us both a morning latte. Then it varies depending on what time J needs to leave the house and what time C wakes up (anytime between 7 and 8:30). We are trying to focus on several things at the moment with Jessie as part of her training/learning process. 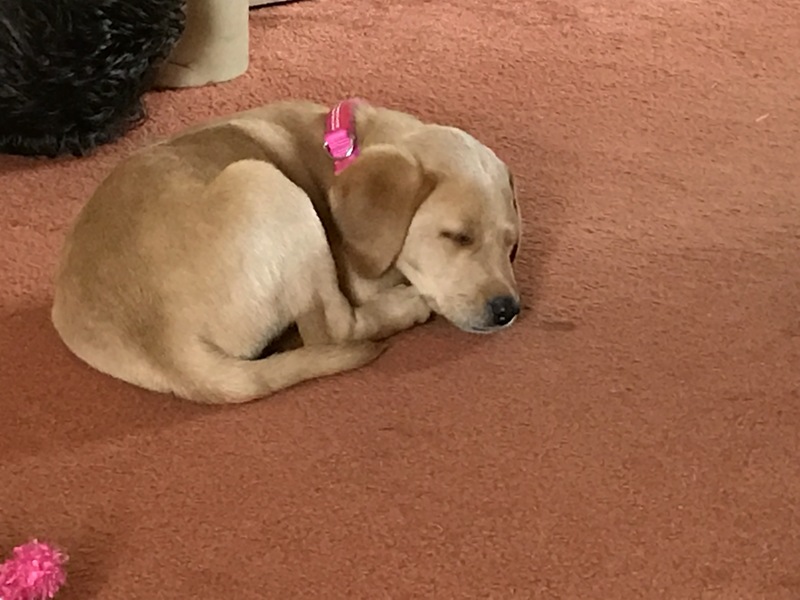 We are trying not to leave her unattended when awake (so we can stop chewing or poor behaviour immediately), if she is asleep on the floor I keep myself nearby (although I do pop to the kitchen/dining room/bathroom as required) in case she wakes up. This has provided some restrictions in what myself and C can get done but we’ve adapted alright so far. When she is awake C and I try to play with her both inside and out (when the weather has been nice enough) and have encouraged her to explore within reason. When C and I are having breakfast, or in fact when any of us are eating, then we are insisting that she is in her crate. For now we are locking the door but we’re hoping as she ages it will become a habit for her to go there when we go to the table. Why are we doing this? Well, both J and I don’t like dogs begging at the table and so want to try and make sure she leaves us alone when we eat. At first she would object when we put her in there but now she is increasingly going in there willingly and is calm and happy there. She now often goes in there herself for naps. Though sometimes just stretching out on the floor is best. There have been lots of attempts at chewing so we’ve had to be firm with her. We’ve also had some distractions which have proven a godsend. My current favourite is her Kong, which, thanks to a tip from a friend, I have been filling with cream cheese and then freezing. It’s great for when she’s in a mood to chew and her teeth are getting to her. She absolutely loves it. 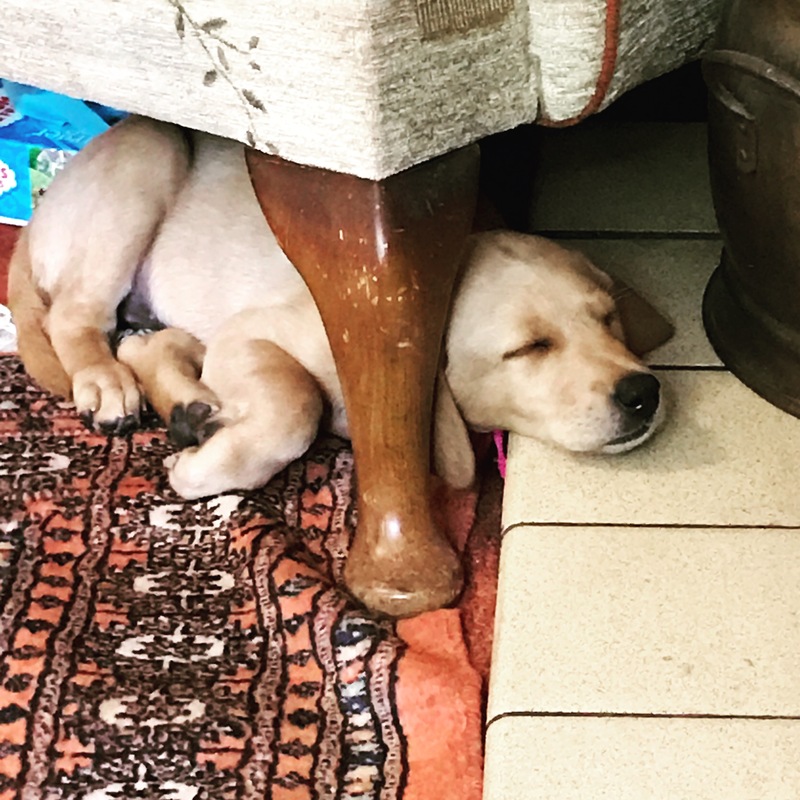 So although it has been a tough week and very trying at times, Jessie is settling in well and I keep thinking that it will only get better in time as she gets older. At least I hope it will. C has been brilliant with her considering how much her life has been upturned, I’ve been really proud of her. We’ve had to find different ways to play at times to avoid lots of tempting toys on the floor but it has been a rather fun adventure. So Jessie went into her crate and went to sleep herself last night whilst J and I were watching TV. We took advantage of that and after J took her outside for a wee, we shut her in and went up to bed. She didn’t cry out and seemed to have settled nicely. Now before we got Jessie, J and I agreed (or more rather I insisted) that any night disturbances were up to him. This was for many reasons; firstly, as J was the one who was so desperate for a dog; secondly, as I sleep with earplugs as I’m a light sleeper; and finally, because I did all the night shifts with C (to be fair to him, that was because she was breastfed and give him his due he did help with middle of the night poos if required). We’d been advised by the breeder not to go down to her in the night. She’s not been attended to in the night for a bit now with the litter and won’t need feeding in the night so she should be fine. Well, she’s understandably going to be a bit lonely in the night as she’s used to having her mum and fellow pups there, but she doesn’t need anything else. Now according to J, Jessie woke up at 5:24am and cried for a bit, C also woke up and started to sing back at Jessie. They all dropped back off and when J got up at 7 there was a fair bit of mess in the cage. She had her breakfast and by the time C and I got up at about 7:40, J was still waiting outside for her to do her business. Today has mainly been spent constantly trying to predict when she needs the toilet and rushing outside with her. She was introduced to her first other dog (that is fine at the age as long as you’re sure the other dog has been vaccinated) and she played really nicely, if rather excitedly. 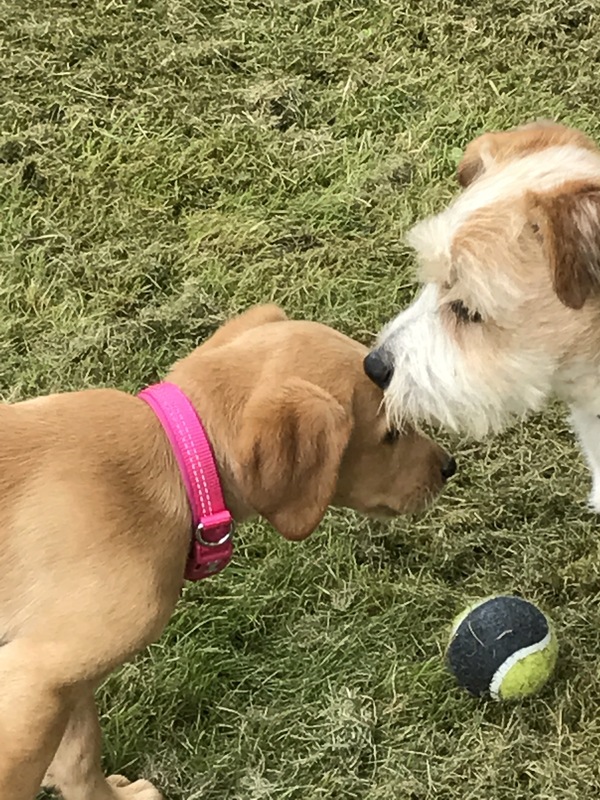 We’re following Kennel Club guidelines about introducing her to as many different types of people/animals/situations whilst she is still young. 16 weeks is considered by most as the cut off time when her big learning and developmental phase will have passed. This is referred to in most of the literature as socialisation. From our point of view, we want Jessie to be a family dog who is comfortable around people and animals and not only fits in with, but enhances our current lifestyle. 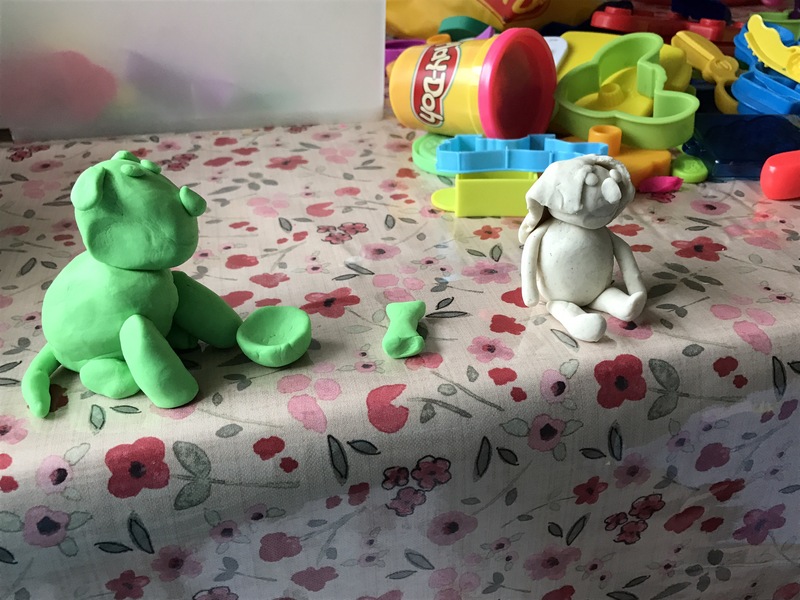 This afternoon we have some more friends visiting and I’m hopefully going to get some more of our friends, with their toddlers, round next week as I think early introductions will benefit them all. First up though, J has just taken her to the vet for her vaccinations so C and I are going to take advantage and get the Duplo out. The plan, which thankfully we managed to execute, was for him to carry her straight from the car to her pee post in the garden for some private time and then lead her into the house through the living room door. There C and I would be waiting to give her cuddles and offer her toys. As soon as C saw her she was ridiculously excited and wanted to hold her lead and give her a walk (she has been ‘walking’ her hobbyhorse for the past couple of weeks with the lead around the living room). 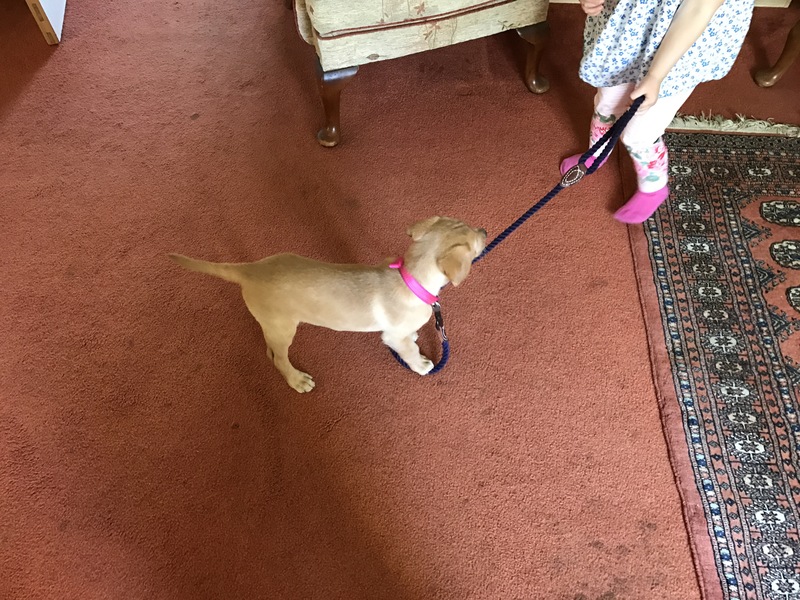 Although both were cautious at first C was soon stroking Jessie and Jessie was trying to play with C. We’re trying to crate train Jessie from the start so we are locking her in there when we have our meals, we don’t want a dog who begs at the table. J had watched her whilst I prepped our tea (very lazy tea of fish fingers, potato waffles and sweet corn so I could focus on Jessie too). When I was serving up J put Jessie in her crate and she whined for pretty much the whole of our dinner, which C didn’t like as she kept asking why Jessie was crying. You have to make sure that she stops whining before you go in so she doesn’t think that if she keeps doing it you will come back. She was pleased to see us when she was let out, although it has made me anxious for how she will be tonight. Soon it was time for her dinner; she’s currently on three meals a day, 7am, noon and 6pm with each feed of 55g. Thankfully she loves her food. I insisted we took her immediately outside. J stayed outside with her for a bit but she did nothing so he brought her back in. A couple of minutes later she started sniffing around and circling, clearly getting ready. I picked her up and managed to get most of it on the puppy pad. Thankfully J was to hand to clean up. As C has now gone to bed, J and I are watching a film and Jessie is having a snooze in her crate, door open, with J lying next to her. This is the type of evening we’d envisaged having with her. Though i am dreading tonight. I’ll update tomorrow with how it goes. So when we had C we didn’t really baby proof. 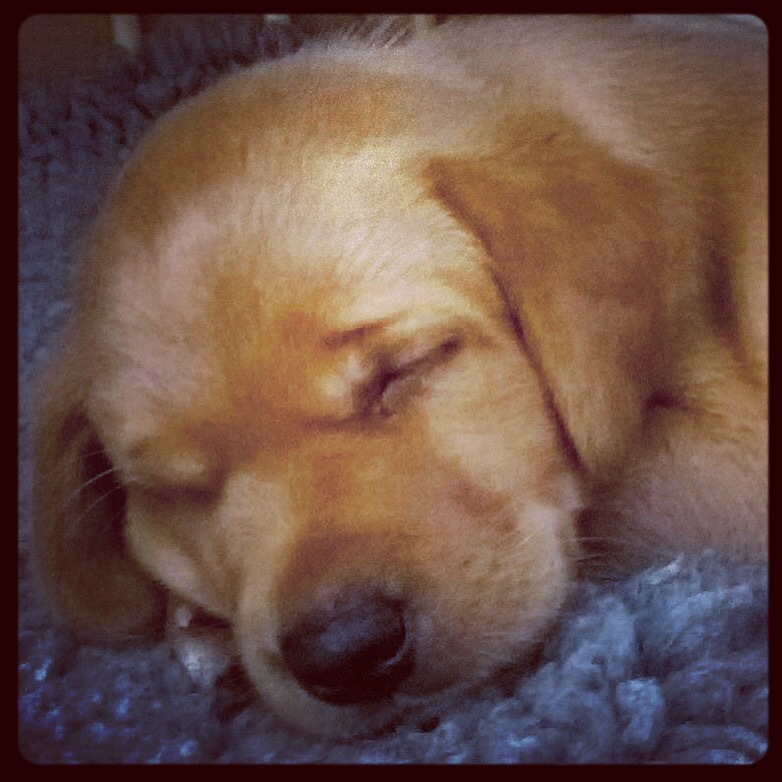 It wasn’t that we were bad parents (I promise) it was a conscious decision, but anyway, back to the puppy. One of the great things about getting a puppy now is that we’re going to be ripping this house to bits so it doesn’t really matter too much about damage. Well that isn’t true. We obviously don’t want a puppy to chew our house to bits but the odd accident on the carpet isn’t going to bother us too much. So whilst we are not planning on encouraging or allowing Jessie to destroy things we don’t really want to have to remove everything precious from our house or get child locks on the cupboards. We didn’t have a stair gate for C and thankfully we won’t need one for Jessie either as we have a door at the bottom of our staircase so we just need to remember to shut it (we’ve decided that Jessie is going to be a downstairs only dog). The big question for me is how much should I declutter downstairs. We are a family who tend to have a fair amount of clutter, not least because we don’t have enough storage space which isn’t damp. C has a lovely beanbag chair which is going up to her room and I may take a few more of her toys up to her room. My knitting basket which sits by my chair will probably move up on to the window sill for the time being. But what will a puppy really try to eat? Or should that really be what won’t a puppy eat!?! 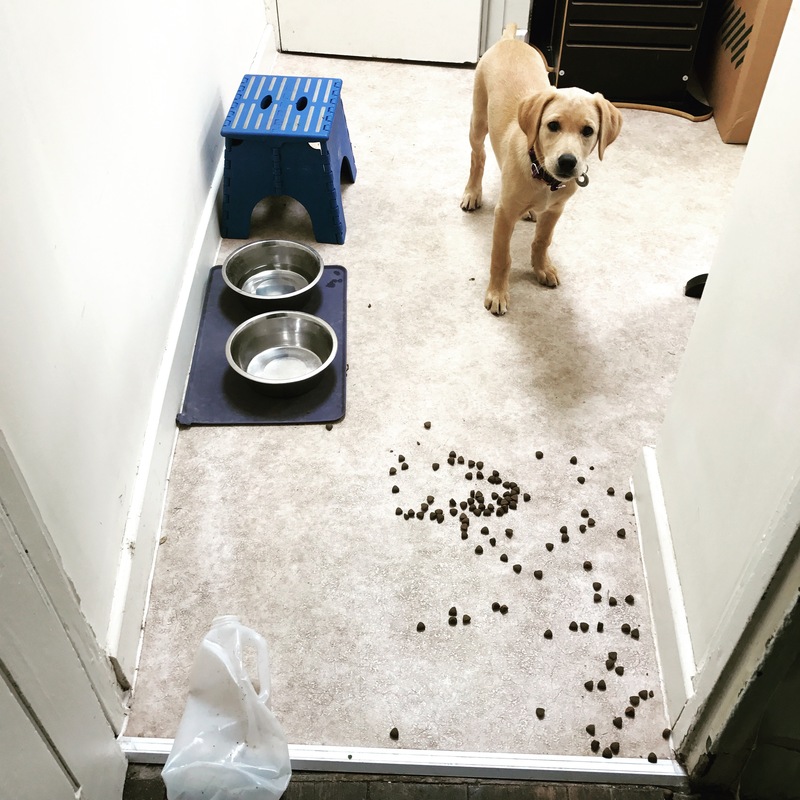 We ran into a dog owner the other day who said that Labrador retriever puppies will eat everything, floors, walls, furniture, anything. And I know that our golden retriever which was a puppy when I was born chewed through the walk right down to the brickwork. So I figure we need to keep an eye on her and as much as possible keep her occupied and away from anything precious. I guess the plus side is that if she chews the walls back to the brickwork then that will actually mean the builders don’t have to do that! I guess when she arrives later today we’ll know whether we made the right decision. Hopefully before she does too much damage, I mean how can anything so cute do damage?